Every day, your web site is pinged 10s, 100s maybe even 1000s of times. Many of these visitors are drawn to your site by your outbound marketing activity and are curious about what value you might bring. Some are here because a search term directed them to you and still others are on your site by mistake. In the 60-90 seconds that the average website visitor spends searching for information, decisions are made that will impact how your offering is perceived and whether or not you are being considered as a solution to a problem. The scary part is, even if you know who they are and what files they opened and or downloaded from your site, you do not know if your content was consumed, understood in context or if it further piqued the curiosity and imagination of its intended consumer. And, until time and resources are spent trying to connect with the web visitor (who, more often than ever, may not want or be ready to engage with a live person) you are in the dark. 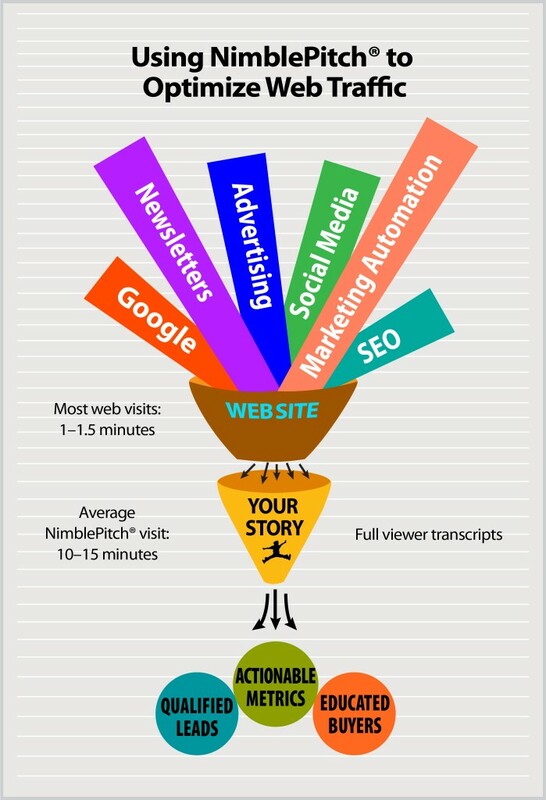 This is where NimblePitch fits into the marketing automation/intelligence mix. First, by hosting vivid and compelling tours of your offering that draw web-savvy buyers into longer, more engaging experiences. Then, providing detailed transcripts of their journey as they explore and interact with your story. This is how modern marketers can build and nurture the digital relationships that now consume up to 90% of the interactions buyers have with vendors.